2 bed apartment close to the Old Town - Property for sale. 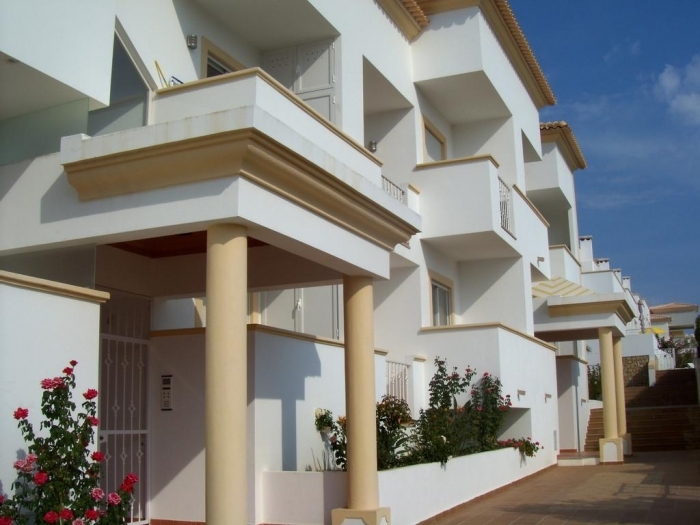 Full Description: This 2 bedroom apartment is located in a popular area just 15 minutes walk to the Old Town of Albufeira. On a small private condominium made up of townhouses and apartments built around the central pool area the location is perfect for relaxing holidays or permanent living. There is a large supermarket & bakery 5 minutes walk away as well as a very nice Portuguese restaurant around the corner. The council are also nearing the end of a project which will have communal gardens and walkways from the area in front of the condominium all the way to the Old Town. Built by a well respected local contstructor the properties have been completed to a high standard. Although this apartment is on the ground floor, access is up a few steps so it is actually elevated. Accommodation comprises an entrance hallway, double doors to the living room with fireplace and doors to a private terrace with provision for built in bbq, fully fitted and equipped kitchen with small drying terrace, shower room, 2 double bedrooms (1 with en-suite Jacuzzi bath) and each with fitted mirrored wardrobes and doors to private terraces. The apartment benefits from double glazing, electric shutters on all doors and windows, security video entry system, spotlights throughout, surround sound system, pre-installation for air conditioning, alarm and central vacuum. Outside there is a large childrens pool, separate swimming pool with sun terraces and gardens and also a tennis court. The apartment also has private remote entry garage space. This is a spacious apartment on a popular condominium with great rental potential. Viewing recommended.